Straight off, I didn’t come up with this combo, but it is so useful to have in your back pocket that I absolutely have to cover it. I’ve heard it mentioned on Josh Augustine’s podcast a few times, and seen it referenced on Reddit and the official forums. 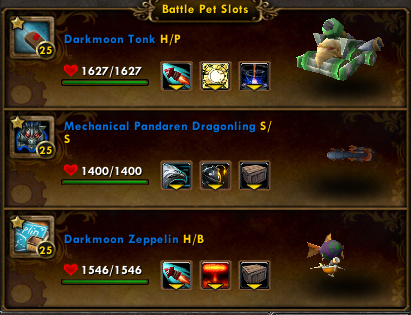 The earliest mention I can find is in this thread on WarcraftPets from May. I’m making this post to discuss your options and the changes coming to this strategy in 5.4. There’s a fairly significant change (possibly a bug fix) and it seems to be undocumented. 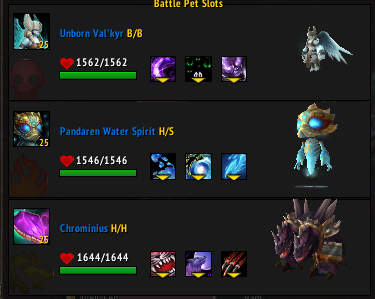 Before 5.3, when the Unborn Val’kyr casts Unholy Ascension before being killed the first time, she comes back for her last turn as a risen undead. 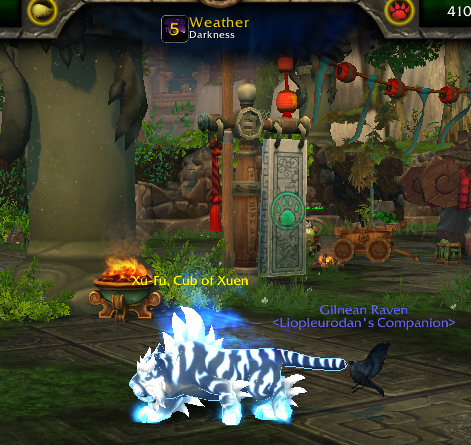 On the 5.4 PTR that function has changed so when she dies from that, she’s dead permanently. So, I cast Curse of Doom first and then Unholy Ascension. You get more from the 25% buff and a weaker Curse of Doom than you from just the buff. Then, you cast Geyser, then Whirlpool, then the 100% damage booster Howl. All the debuffs (except Curse of Doom with 5.4) explode in one turn, but in multiple hits, so any healing ability or damage capper (eg, the Magic family racial) is pretty much negated. Even if not, the post-Blastoff turn from Surge of Power with Chrominius is ridiculously deadly, especially since you definitely just triggered the Dragonkin racial boost. 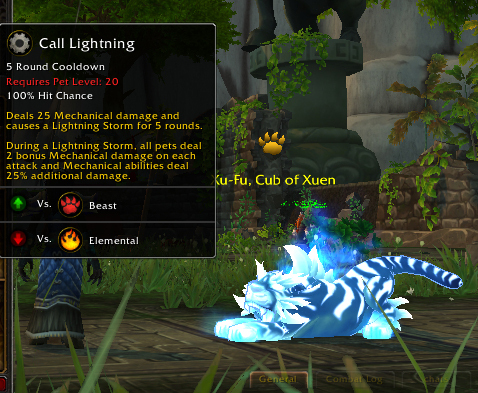 On the Celestials you can run into the 35% per hit Boss Buff ceiling a bit, but still kill them with just the three hits. 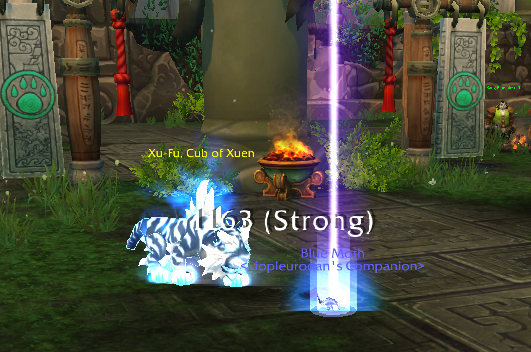 With the Unholy Ascension nerf, the only pet you absolutely must have for this strategy to work is the Pandaren Water Spirit. That’s the only pet with both geyser and whirlpool, and there aren’t really any other pets with a one-off staggered delay nuke like those. 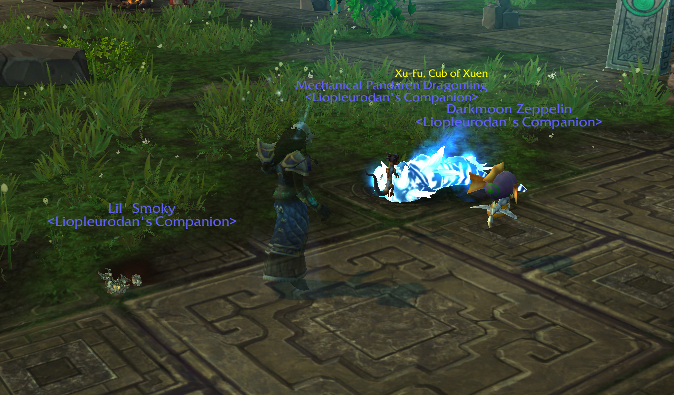 You can try working in a Ghostly Skull for the Val’kyr. 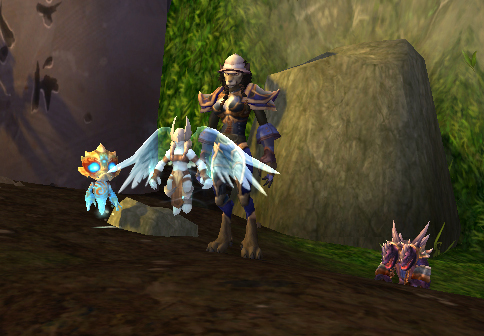 That’s the only other pet with Unholy Ascension, which is fairly necessary here. Howl is a very good debuff for both PVE and PVP, so much so that it gives this strategy its alternate name: the Howl Bomb. There are other pets with Howl, but none of them have that next turn backend punch Chrominius can pack with Surge of Power. 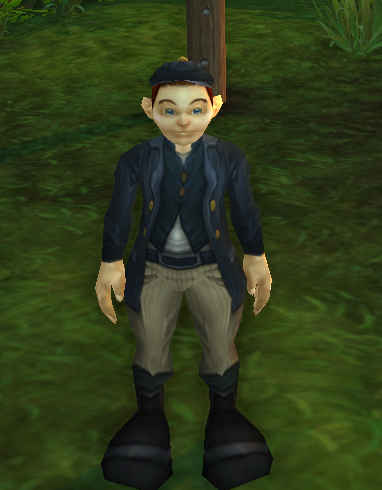 Tito or the Lil Bad Wolf are alright choices, but you can only expect to hit for a few hundred with their other abilities, because all the solo pets have additional damage absorbing buffs. Beyond Howl, there are a few other abilities that cast the Shattered Defenses 100% damage multiplier debuff, and all the rest are Swarm-type abilities. 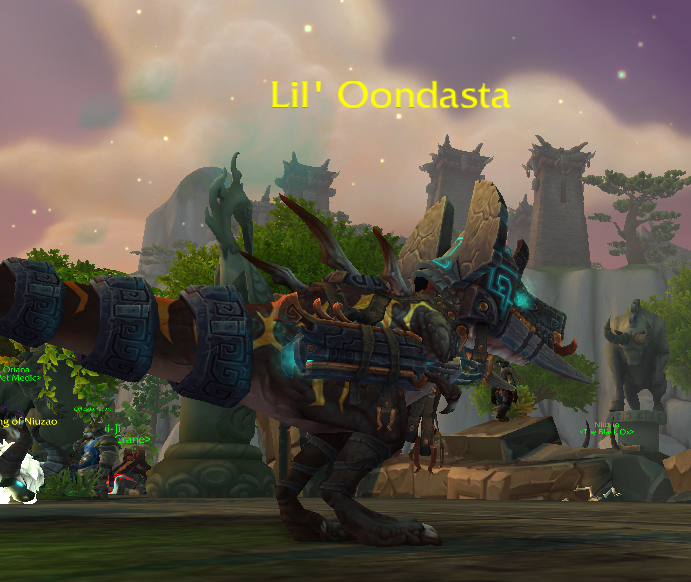 You might want to experiment with a Zandalari Kneebiter, for instance. However, if you do go this route, make sure you use your Hunting Party right off the bat. Don’t try to get cute and cast Black Claw first. The big nukes need to get that 100% debuff or you’re in trouble. The nature of Swarm abilities means if you’re going against a pet with a damage shield like Yu’la, or are making use of a Sandstorming Anubisath, you’re not going to apply the debuff so be careful of that, too. And, if you’re up against a healer like Dos Ryga, a swarm pet isn’t going to be able to burst him down for those last hits before he heals. 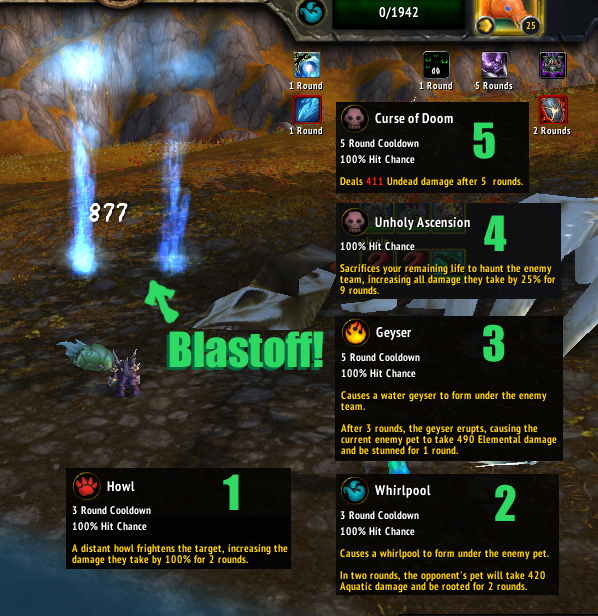 To be absolutely clear, if you’d like to use a Howl Bomb strategy I’d highly recommend getting all 3, yes even the Val’kyr, even though she’s a bit of a camp. With those 3, this is a very solid, easy strategy to use. Without, it can get a little dicey. I feel a little cheap using it, but I will certainly be using it during the Tournament myself. For the Tournament, because of Yu’la and Chichi’s avoids, and Chichi’s heals, I wouldn’t recommend using this for those two. Because Zao’s heal is on a turn delay, this is a decent pick for him. 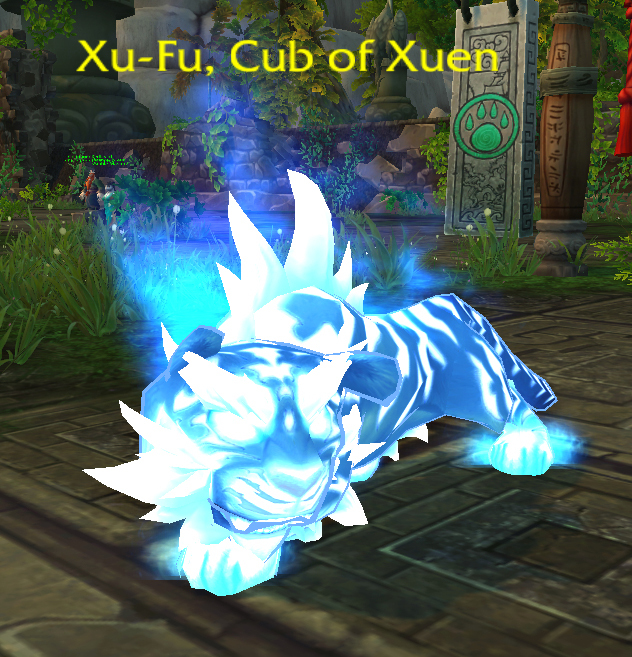 Personally, because I typically only maintain one of each battle pet, my choice is likely going to be Xufu, especially on the week featuring Mari and Kiryn. This entry was posted in strategy, video and tagged 5.4, beasts of fable, celestial tournament, strategy, video on September 8, 2013 by Liopleurodon.